The production of packaging. 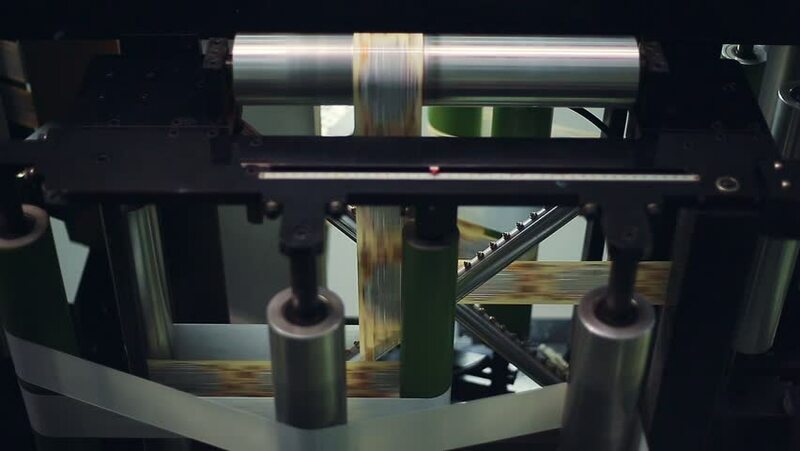 Rotating shafts and moving tape. The printing shop. Unique device for printing on package. Manufacture of packages for frankfurters. hd00:35CIRCA 1940s - The Fighter 96 is a Fighter model adopted by the navy in 1936, the same ship was adopted in 1937 by the army and named Fighter 97.
hd01:52CIRCA 1960s - An overview of the U.S. Post Officeos automatic mail culling and stamp cancelling system in its testing period, in 1968.
hd00:23A machine inside approaches and object and it starts spraying it with a special liquid. The door needs to be closed.